Stuart Laycock studied Classics at Jesus College, Cambridge then worked in advertising and marketing for many years. During the Bosnian war he helped set up and run SOS Bosnia, working to alleviate suffering on all sides in the conflict. He went on to run Lifeline Humanitarian Organisation for HRH Crown Princess Katherine of Yugoslavia. He now works as a freelancer in television. Since Cambridge he has kept a close interest in the period surrounding the end of Roman rule in Britain. He has built one of the biggest private collections in Britain of late Roman zoomorphic buckles, and has been working over the last year, with among others Chris Marshall and Kevin Leahy to try to answer some of the main questions about these buckles. He is married, and has two children. A review of Stuart Laycock: Britannia - The Failed State: Tribal Conflicts and the End of Roman Britain, The History Press Ltd (2008). 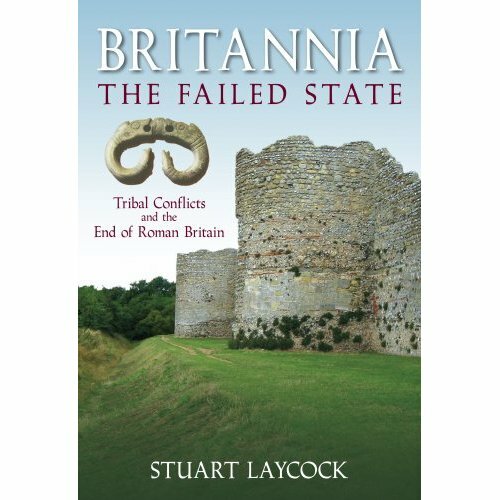 Stuart Laycock: Britannia - The Failed State: Tribal Conflicts and the End of Roman Britain, The History Press Ltd (2008). The end of Roman rule in the Western empire was not a nice time to be a citizen of that empire. The economy was collapsing in an alarming rate, trade ground to a halt and many lost their source of income. If that was not enough, the climate was changing, forcing farmers to give up marginal fields and pushing the sea inland, forcing the coastal dwellers to flee inland. Wars seemed to be closer than ever, the once-strong Roman military now seemed ever more powerless against barbarian raiders, who were probing inland ever daringly. Or, as a 6th-c. Briton put it: "The barbarians drive us to the sea; the sea throws us back on the barbarians: thus two modes of death await us, we are either slain or drowned." And added to that, the few Roman generals seemed to be less concerned with these raiders than with their private attempt for the throne - each supported by such numbers of those same barbarians that the common man was left in doubt by the wayside, oblivious as to whether the passing army that had just flattened his crops belonged to an invading force or to his own failing military. Amidst this scenario, it can only be seen as logical that one after another, local governments reached the conclusion that they had to start looking after themselves. The civitates or provincial districts of Britain, once the mainstay of governmental rule in Britainslowly began their journey towards independence, a road that would eventually lead to the emergence of early Medieval kingdoms. Towns bricked up most of their gates, restricting access and facilitating defence of the walls. Sometimes towns and settlements down in the valleys were even given up, the people seeking safety in the hills and the cold comfort of resurrected hill forts. Weapons were hoarded, first in defiance of the Roman government, but when the power of Rome fell short, openly until a nucleus was formed of a new power. Finally, the transformation was complete  a town official had changed into a warlord, and his citizens into his Dark Ages army. The author takes us on a journey that has us visit every step of this development, but in order to understand all the detail behind this process, he takes the reader back to Britannia before the Romans. Because here is where the beginnings lie, the seeds that only grown into sturdy trees after having lain dormant in the soil during the 400-dd years of Roman occupation. Before the Romans came, there were tribes in the island of Britain, the Celtic tribes who twice defied Julius Caesar and held out when most of Europe south of the Rhine and Danube had been conquered by the seemingly invincible legions of Rome. Only generations after Caesar did the Romans return to Britain, conquering it in the decades after their initial landing. However, even during that conquest the Britons showed their teeth, the Iceni uprising under the now famous queen Boudicca coming close to driving the Romans from the island a third time  who knows how history would have changed if they had succeeded? But they failed, and slowly Britain was pacified, Romanised and changed into a province like every other province that was part of the empire. Here the author takes us onto a new path, a narrow path that meanders adventurously through the thicket of a forest which at first seemed so very well-known, but which suddenly seems very alien. What if the British tribes did not change into peaceful Roman citizens, Romanised or not? What if they, instead, passed on the tradition of animosity towards their former enemies, now neighbouring Roman civitates, from father to son? Here the Bosnian scenario comes into full play: old grudges, harboured for generations, suddenly bursting into life again whenever the joke of Roman power seems that bit lighter. Some raids may have followed, although the evidence is hard to interpret. At the end of the Roman empirein Britain, it may even seem that the tribes re-emerged into their own right, bearing arms to defend themselves against raider or overeager neighbour. Personally I may occasionally have lost my way among these dark trees, but its worth the reader tracing their own path through this forest, to finally arrive again on a sun-warmed glade. The transition from Roman civitas to post-Roman kingdom, once hidden in a grey mist, now seems so much more clear. Germanic federates, not arriving by the boatloads on the shores, but invited by warring proto-kingdoms, had a much easier task that way, instead of having to fight their way inland at every step. It is not surprising, according to this theory, to find that the geographical border of the emerging Anglo-Saxon kingdoms shared much with both the pre-Roman tribal borders as well as the civitates in-between the two. A form of continuity may well have been the case. This book is a great read. The reader is challenged with an avalanche of facts spanning the three periods of British history before Medieval times (Celtic, Roman and Anglo-Saxon), and may be forced to re-read a lot of books as a result of this one!